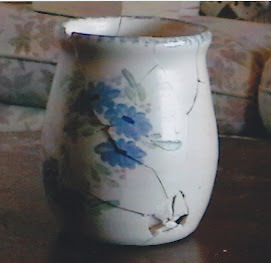 I've been thinking that I should share why I have a picture of a broken pot on the blog. There is a reason for it. Many of you might be wondering why in the world I took a beautiful ceramic pot, went outside, and threw it on the ground where it broke and shattered. Yes, I did it on purpose. I can't take full credit though. I got the idea from another blogsite. It's the site that I have a link for on the right side of my page. I did it over a year ago on Halloween actually. And I was grieving over my losses. I read that other blogsite and she had done this same thing. She said it made her feel so much better. She explained that God told her to go and break a ceramic pitcher and then glue it back together. It was to symbolize the brokenness that she felt and how God can put our broken pieces back together again. She challenged her readers to do the same thing and submit pictures of their pitchers or pots. So I took the challenge. Halloween day I took this pot (which was a wedding present), went out to the driveway and threw it down as hard as I could. My dog looked at me like I was nuts (maybe I was). Some of the pieces were still pretty big so I threw them down and broke them some more. Then I put all the pieces in a bowl and went to work glueing it all back together. It didn't take as long as I thought it would, but I had glue all over my fingers and had just about glued my fingers to the pot a few times. Then it was done. And seemed to see my life before me. I felt so broken, so un-usable. This pot seemed un-usable now, right? I mean who keeps broken pottery? But then, another thought. (I think I heard this from this source as well). If I were to put water in this pot, it would all flow out onto whatever was around it. Just like me, if I have these cracks in me, and then fill me up with Jesus, Jesus will flow out onto whatever(whoever) is near me. There was a purpose for me. Then I got an e-mail from someone about two pots that were used to carry water. The woman who carried them had to travel a distance to get the water and then back. One pot was a good pot, no cracks or anything, and all the water stayed in it the whole way back. The other pot had a few cracks and by the time they got back home it was empty because all the water would leak out. This pot felt so bad. Maybe the woman didn't realize that the pot had a crack. So one day the pot asked to woman why she kept using it to carry water when it could not hold water. It was not worthy to hold water. The woman said "look at the sides of the road that we travel to get water. One side, the flowers are dying and do not look good. The other side has the most beautiful flowers from being watered often. Dear pot, I have always known you have cracks, and that is why I filled you with water and carried you back. You watered my flowers so people could look at their beauty." After reading this story I realized that God was speaking to me, about how He knows I have cracks. He knows I have not had a perfect life, but those cracks can be used to spill His Love out on the people around me. So today I pray that you would feel the love that is pouring out of my cracks. The cracks that were painful to get, but so very worth it if you are able to feel God's love through them. Lord, let your love pour through me. I am broken, sometimes I am so weary I can't seem to go on. I sometimes hurt so bad that I can't stand it. But God, this is a part of life, it's a part of growing and learning to lean on You. Please help these "broken pots" come to know you in a deeper way so that they may pour Your love on those around them. In Your name I pray. Lessons in "Facing the Giants"